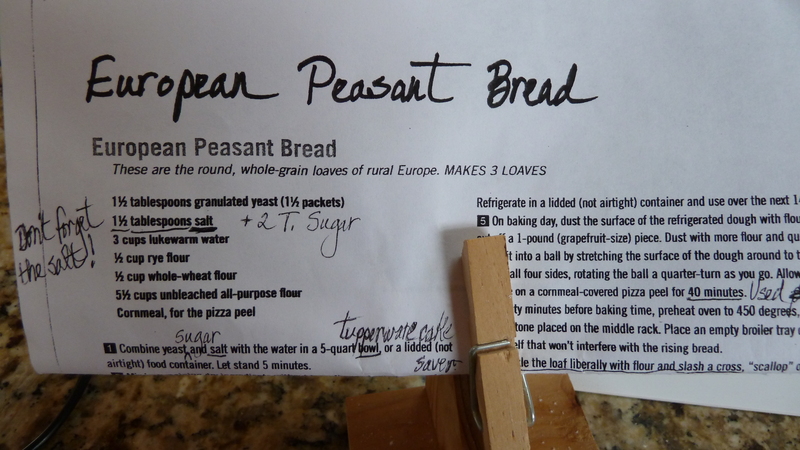 artisan bread, baking with a stone, cooking, European peasant bread, Mennonite cooking, Peasant Bread, pizza stone, Recipes, Whatever Happened to Dinner? My friend Janet brought a tasty/crusty loaf of bread to our house church potluck a while back and shared the recipe when I asked. But it took me forever to get around to trying it, because I first had to acquire a stone, which I received for Mother’s Day last year. (I get the impression that most cooks under 40—at least if they are into cooking and baking at all—pretty much consider a stone to be an essential piece of kitchen equipment.) I also had to pick up some rye flour for this recipe (a huge bag from bulk food store that I promptly split with Janet). I’ve baked standard bread loaves for so long that usually it doesn’t take my reading and re-reading all the instructions, but that is what I had to do here. 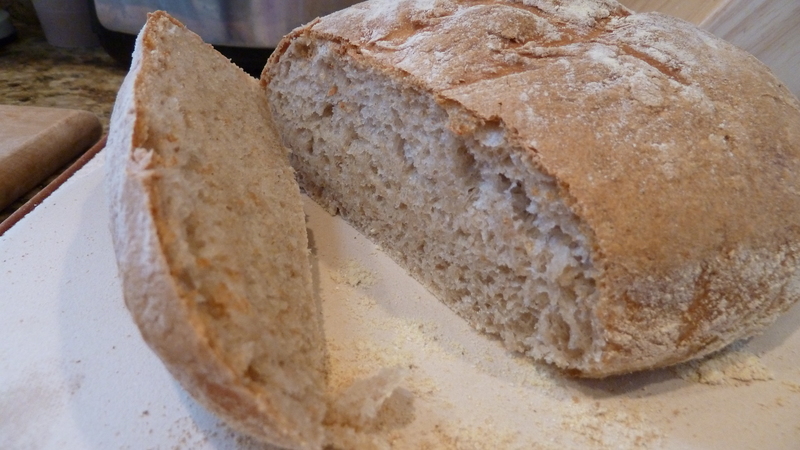 But it was a new learning experience for this cook and I loved the taste, texture and the fact that I could keep two unbaked blobs of dough in the fridge for up to two weeks to bake and have fresh bread for a meal, without doing all the mixing up work. The bread also carried me right across the big pond to so many lunches of bread, picked up in Spanish, French, or Belgian markets topped with sumptuous hunks of cheese. 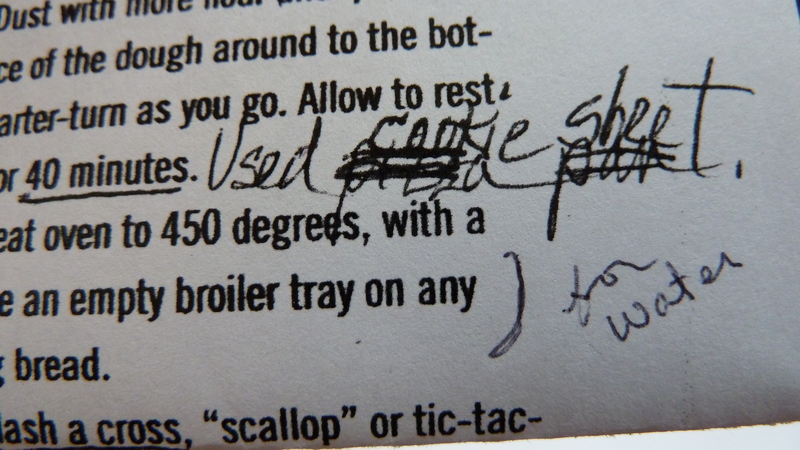 And I LOVE Janet’s notations on her recipe page. She is a real note-kind-of-person. Combine yeast, sugar and salt with the water in a 5 quart bowl. Let stand 5 minutes. Mix in remaining dry ingredients without kneading; use a spoon, large food processor with dough attachment, or a heavy-duty stand mixer with dough hook—that’s what I used. 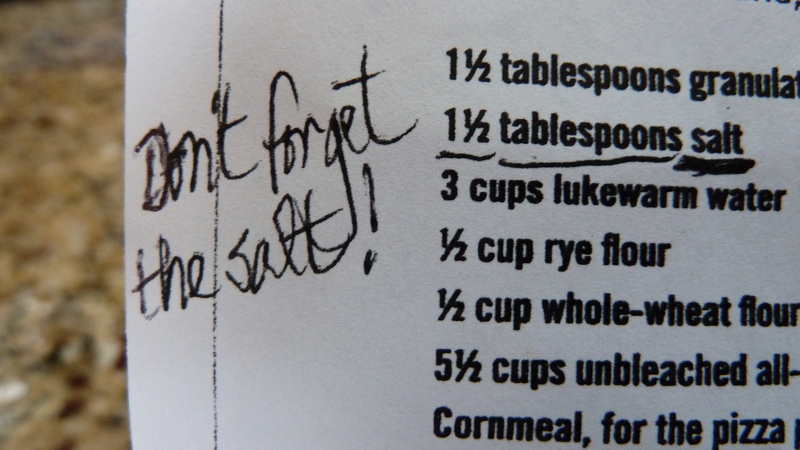 If you’re not using a machine, the recipe says it is helpful to use wet hands to incorporate the last bit of flour. When combined, cover mixing bowl with a tea towel. Allow to rest at room temperature until the dough rises and collapses or flattens on top, approximately 2 hours. The dough can be used and baked after the initial rise, but the dough is easier to handle cold. Refrigerate at least one hour before baking if doing the same day. Dough can be saved and baked anytime over the next 14 days. On baking day, dust the surface of the refrigerated dough with flour and cut off a 1 lb. (grapefruit-size) piece. Dust with more flour and quickly shape it into a ball by stretching the surface of the dough around to the bottom on all four sides, rotating the ball a quarter turn as you go, to make a smoother ball. Allow to rest and rise on a cornmeal-covered pizza peel or cookies sheet for 40 minutes. Sprinkle the loaf liberally with flour and slash a cross, scallops or tic-tac-toe pattern into the top of the loaf, using a serrated bread knife. Leave the flour in place for baking; (you can tap some of it off before slicing the baked bread). Slide the loaf onto the hot stone. Pour 1-2 cups of hot tap water into the broiler tray, and quickly close the oven door. Bake 30-35 minutes, or until the top crust is deeply browned and very firm. Smaller or larger loaves will require adjustments in baking time. Cool a while before removing from stone or slicing or eating, but you can still cut off and eat some slices while they are warm! Store in refrigerator to keep from mold. I wrapped my loaf in a tea towel and put in an unclosed plastic bag. This bread makes great toast and is always good warmed up. I wasn’t sure if I had the cooking chops for using a stone but it turned out! Have you ventured into a new area of cooking or other hobby? See these Pinterest boards for more artisan bread ideas. 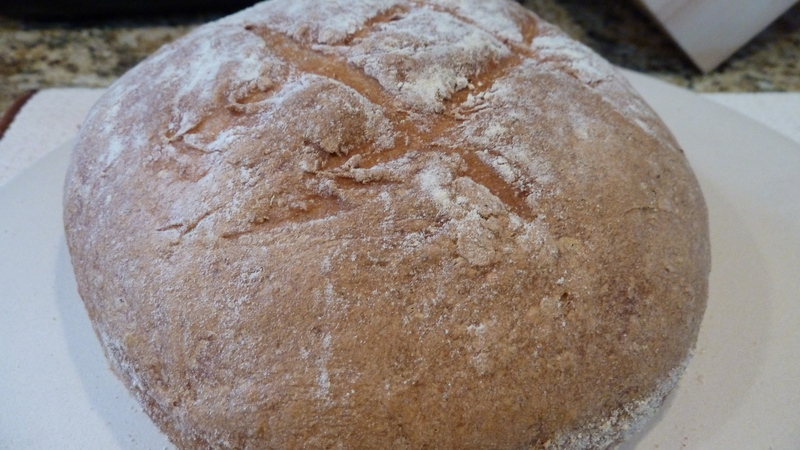 For more great bread recipes check my book, Whatever Happened to Dinner. Thanks for hopping over here. Thanks for letting me know you visited and go for it! Not that hard if you can follow directions. Your more than welcome to have a look at my blog as well. A stone?? I just got rid of 2 stones that had been taking up space for years, as despite what every one said, I never found them needed. They were given to me by women who also found they didn’t want them. It seems just as easy to substitute the cast iron fry pan, flipped over if necessary. I already have a place for that. 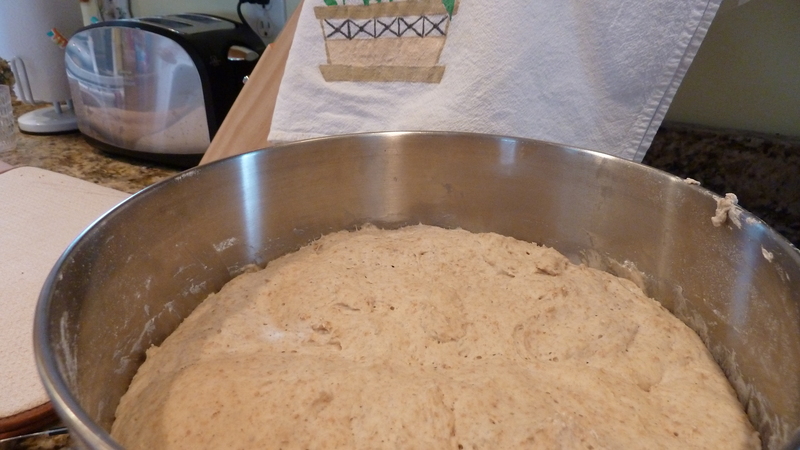 I like the sound of bread dough keeping in the fridge until ready to use. I should have asked all my friends here for a stone (the scripture/story from Jesus comes to mind here: what father would give his son a stone who asked for bread. Ha ha, small joke.) I don’t promise I will use it a lot. But you know what, I do not own a cast iron skillet. Perhaps I’ll have to break down and buy one yet! And yes, it DID work to get the dough in the fridge. Thanks for commenting!